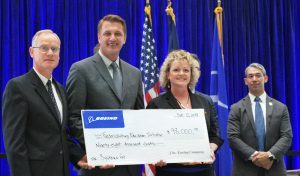 Jay Galloway, Boeing San Antonio Site Leader, presents Boeing’s Our Future: Tomorrow’s Innovators grant to SystemsGo. From left: Scott Netherland, Executive Director of SystemsGo; Galloway; Rebekah Hyatt, SystemsGo Program Director; and Ron Nirenburg, Mayor, City of San Antonio. Jan 15, 2019–Dayni Alba, Boeing Global Engagement, Texas, has announced the awarding by The Boeing Company of a grant to SystemsGo, the Fredericksburg, Texas-based nonprofit organization that provides curricula and training in science, technology, engineering, and math (STEM) education to high school students. In announcing the award, Alba highlighted the achievements of the SystemsGo program and its impact on STEM students. Boeing’s gift of $98,000 was one of 14 awarded in Texas this year. It will enable SystemsGo to fully implement the program in Bexar and surrounding counties, which will directly impact over 1,000 students per year. This grant is part of Boeing’s Our Future: Tomorrow’s Innovators, targeting increased STEM diversity, proficiency and interest among K-12 students. This year, Boeing awards $55 million in grants to nearly 450 nonprofit organizations across 47 countries. SystemsGo is an innovative program recognized for having high school students design, build, and launch rockets. The program was developed at Fredericksburg High School in 1997 and is now used in high schools across Texas, New Mexico, Utah, and Oregon. Students design and built increasingly sophisticated rockets to meet performance goals. Participants are the only high school students in the nation to launch vehicles at the U.S. Army’s White Sands Missile Range, designed to reach 100,000 feet. The SystemsGo program has been featured on NBC Nightly News, is endorsed by NASA and certified by The Space Foundation. Boeing is the world’s largest aerospace company and leading manufacturer of commercial jetliners and defense, space and security systems. A top U.S. exporter, the company supports airlines and U.S. and allied government customers in more than 150 countries. More information on SystemsGo is available online at www.systemsgo.org, via email at info@systemsgo.org, or by calling 830-997-3567.